We were up early. Pam decided in the night that her desk could go under the bedroom window and then she could buy the one she first wanted. She also remembered the clerk saying there computer problems had begun at 7 AM the day before – when they opened. So she went off to buy her new desk. She wanted to know if I wanted to tag along, but it was too much excitement for me. I don’t particularly mind waiting around in airports. I hate being rushed and afraid, so I prefer to be early. Of course, that’s not just for airports. The original plan had been for Jen to take me with her while she took Ryan to school and then drop me off at the airport. Instead, we opted to have Pam take Ryan to school, Jen take me to the airport, and Cheri to wait for the Qwest person to show up with DSL stuff. Cheri has tried so many new things on this trip. She was working crossword puzzles, she had a massage, she stopped the business business. 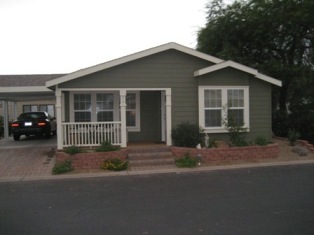 She and Hannah were left at Pam’s house while the rest of traveled around the super highways of Phoenix. It all worked out. Jen missed the exit and so we went to the airport the other way. I was still checked in and at my gate before 10 AM. I got my bagged checked immediately without paying for anything after I showed my receipt with the early purchase date. I walked right up to the TSA agent who checked my ID and ticket and waved me through. The longest part of going through the next checkpoint was loading my stuff in the little baskets. They permitted me to bring my contact solution without any questions. I got to my gate area crowded with lots of people. The flight to Orlando had been delayed for two hours and the flight to Maui wasn’t scheduled to take off yet. Both planes boarded at the same time allowing me to move to an electric outlet and plug this in. I’ve had such a great time. Laughing with my sisters. Playing with my sisters. The whole adventure of being Thelma and Louise and Louise. Playing with Ryan and Hannah. And Jen. Being in the dry heat. Seeing a monsoon storm. But mostly laughing. And playing. This has been so much fun. I miss them all already. We had a busy day scheduled. We could loll around for the early morning. Then we went to Staples to get out limited supply supplies. Their computer system wasn’t working properly and they couldn’t do many different things. What they could do, they could only do slowly. The man in front of me was trying to return something. He had both his sales receipt and his credit card. They couldn’t process his return and were willing to give him a store credit, which – as he explained – didn’t quite meet the ‘return’ portion of the bringing unwanted goods back. They only could offer him directions to another store. We were looking for paper products and had a limit of five lined paper packs and three 2-pack notebooks. Except I thought it was five of each. Instead of charging me the greater amount, I got all five (instead of the limit of three) for the reduced price. I guess the fouled up computer system worked in my favor. From there we went to Massage Envy. This time we were there on the correct day. We got signed in, Cheri got to read the paragraph stating there would be no inappropriate touching and anything that made her nervous would be stopped immediately. We each were called to our separate rooms and Desiree came for me. I explained about my bad elbow and then got ready for a treat. Each therapist does this a little bit different. This was no exception. She did a wonderful job and my elbow actually felt a little bit better. When it was all over, my elbow felt better and the lump was somewhat lessened. I have hope now that eventually it will all go away. Cheri was not only no longer embarrassed or afraid, but making plans of when and where to schedule her next one in Milford or environs. There is a Massage Envy in Summerville, but it is fairly far from my house, so I’m not sure I would want to do that. Cheri’s closest was in Mason which is way out of the way. From there we needed to get a quick lunch in order to get to Jen’s house for her to make it her doctor appointment childless. We stopped at a Mexican Food place and the menu didn’t meet our requirements. Next we stopped at a pizza place and the pizza was sold by the slice. They looked like they had been sitting under the heating lights since the Punic Wars. We got back in the car and moved across the street, looking for a place to eat decent food quickly. We found another place, New York Something or Other that served pizza, subs, salads. We thought that sounded safe. We got a pizza to share, half pepperoni and half mushroom. Cheri and Pam ate the mushroom part (Pam saying it was one of the best she had ever had) and I had the pepperoni part with the other two pieces going with us to Jen. I had tried to cash a traveler’s check at Staples and that didn’t work. The pizza place had no problem with it. I had used my cash as my tip for Desiree and needed to have some cash money for my day in airports. We got to Jen’s house and we all plugged into the internet and got email and access to search engines. Pam kept looking for a desk that would work until her new office was built. I updated my webpage. Cheri started downloading games. We were doing quite well babysitting two sleeping/resting children. They both survived, as well as the dog. However, when Jen came home, Nomar alerted the children to an intruder in the house. They both woke up and we asked about the new fish. They had gotten three fish the day before. Orange, Grape, and Corn were swimming when Jen left. When Ryan again checked his new pets, Corn was sleeping in the water. Cheri used a fork to scoop – not stab – the dead fish out of the tiny tank. Jen was too distraught by the whole process to be included in the fun of Corn’s burial. Jen was sporting a bandage on the back of her neck, post doctor visit. This did not make her any better with the ick factor of the day. We got in the car and headed over to The Cheesecake Factory for dinner. Pam got a shrimp and bacon club sandwich; Cheri and I both got pasta. Pam’s plate was heaped way too high for reasonable people. I don’t know how anyone even carried it to the table. We were there before 5 PM and got to order from lunch menu. Our pasta was still almost too much to eat. We ordered our cheesecake as take out and left as very happy people. We then went to the pool and the pool patrol person eventually came by and kicked a few kids without passes out of the kid pool. We were in the adult pool and she came over to us and wanted to know if we had any residents there. We pointed to Pam who had noted earlier that her plastic name badge was left at home. Cheri and I both had our cardboard-in-plastic-case passes hooked to our jackets. The woman insisted we needed them in the pool. We tried to explain they were cardboard and she eventually capitulated and permitted us to remain in the pool. We headed back to the house walking the long way to look at some of the other cute things people have done. Monte Vista is really nicely laid out and many of the houses are really well done. We got back to the house and showered and in our jammies. By this time it was 8:30 PM and we were going to play Cheri’s card game. She had written down the rules – kinda. She didn’t really know everything there was to know. Like how many cards to deal, what to do with them after they were dealt. Things like that. So she called Heather. Heather noted that it was 11:30 at her house. But she willingly told us the rules. We played the first hand. I tried to play my cards the way I thought Cheri said we were playing and then she was confused and called Heather again. Good thing she likes her mother and her aunts. We finished our game and then went back to reading and crossword puzzles until we headed off to bed. Today was our day for Pam to treat us to a massage. Cheri was up at the crack of dawn when the first number was still a 5 because she was so nervous about this experience. We had some more of the pastries from yesterday and then piddled around until it was time to go for the treat. Cheri had questions for us on the way. I have been getting massages for about 20 years now from a variety of people and places. I have never been frightened. I have been unsure of whether or not to tip the person or not, but that’s been the extent of my uncertainty. Cheri – not so much. She can make anything much more exciting by adding a wonderful layer of absolute terror to the mix. Most of us think of a massage as a soothing and restful task. Cheri was obsessing about all sorts of ill-imagined things that were not going to happen. Who knew that could happen. We were told to get there early to fill out some paperwork and so we got there a little early and found out that we were, in fact, a lot early. We had originally had a set time for 7 PM on Monday but there was then some problem with this. They called Pam and asked if 11 AM would be okay and it was. What was not made clear was that the 11 AM was for Tuesday and not for Monday. We were going to have to come back tomorrow. We left the place and Cheri mentioned that she had done all that worrying for nothing. Like that’s not going to be the case no matter what. She is planning on being overwrought for another day and night. Silly goose. We went to Famous Footwear so Pam could look for the shoes that don’t hurt her feet. She couldn’t find any. We then went to Staples and each of got the limited things and I also got a new computer carrying case. The one I have is just not very good and I had been looking for one even back in South Carolina. The bonus here is that we can go back and get all the limited stuff again tomorrow when we go to get our scheduled massages. It also meant I could make sure my computer fit in the bag and if it didn’t, I could return it the next day. Our next job was to find a place for lunch. There were strip malls on each side of the road. We didn’t see anything that looked all that promising on the side we were shopping in, so we tried to get across the street. Instead, Pam was in a left turn only lane. So we pulled back into the shopping center we had just left – rather than drive forward and end up on the 60 – and tried again. We ended up eating at the Village Inn. The place gave discounts for people aged 60+ so only Pam was eligible. One page was filled with lower priced, smaller portion meals. Pam and I both ordered from that so she wasn’t allowed to have the discount. Cheri didn’t read the menu as well and ordered a fancy hamburger. Pam and I both ordered from the cheap page and so we got soup or salad along with our entrée and then a half piece of pie. The soup was absolutely delicious – potato with a dollop of sour cream, smothered in shredded cheese and loaded with real crumbled bacon. Cheri got to watch us eat that. Then came our entrée and they mistakenly messed mine up. But it got there eventually and we ate like we hadn’t seen food in a week. Then we got to have pie. 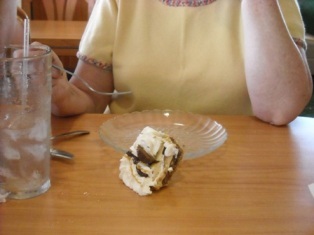 Cheri opted to purchase her own half slice while we ate ours. She got a lemon thing while Pam and I got chocolate peanut butter pie. Pam is always such a lady. Pam politely picked portions of peanut butter pie from the pretend-wood table and proceeded to polish off the pleasantly palatable dessert. We then got on the 60 and drove over to Sprouts without incident. Unless the guy weaving all over the road while doing 35 in a 65 counts as an incident. He got off at the same time we did. We thought he might be drunk, but he was only old. Tee-rific. We headed for Sprouts and were going along without problem until we encountered nearly stopped traffic on the 60 which has a speed limit of 65. Coming up on brake lights, Pam also hit the brakes to avoid slamming into the inexplicably slowed traffic. With cars swerving this way and that we came upon the problem. There was an old, beat up car swerving all over its own lane and part of the next when it wasn’t veering off into the berm. The car was doing perhaps 35 mph, which was about 30-40 miles per hour slower than the rest of the traffic. We assumed it was a drunk driver having had a delicious lunch of not-peanut butter pie. We were glad we were coming up to our exit. Unfortunately, it was also the car’s exit. As we passed, we noticed it wasn’t a drunk driver, but an 80+ year old driving his dad to a doctor appointment. Welcome to Arizona. We went into Sprouts – a grocery store filled with locally grown produce, high quality meats, and a variety of organic and healthy food. They also have rows and rows of bins of package it yourself foods. Not everything is health food; I got a large bag of salt water taffy which had a bonus of being on sale. Cheri bought tea. Pam bought real food. So far, Pam has purchased a whole watermelon for $1.88 and cherries were $1.77/pound. She got a roast we cooked in the crockpot and it was absolutely delicious for dirt cheap. We don’t get prices like this back east. We came home and began our restful activities. I got pictures from Cheri’s camera (mostly for the pie incident, but found several other really good pix, which is why I have added more here) and piddled with that while Pam and Cheri read. We then decided to go to the pool. Cheri kept saying it would be fun and the two old coots let her talk us into this. It was fun. It’s all fun and games until someone loses an eye. We were bobbing in the water which is five feet at its deepest point. Pam wanted to be sure to keep her hair dry and so she was bobbing along with us. Cheri and I, being younger and far more nimble were bobbing in circles and Pam tried to follow suit. We all have no idea what she did, but she somehow twisted her bad foot and got to the side of the pool gasping in pain with a bad left ankle. She could stand on it without increasing the pain, but it was a constant throb. It is not at the side of her ankle where her Ireland injury was, but rather more along the Achilles tendon. Eventually we were all out of the water. Pam first, sitting on the side of the pool reading, me sitting on the side drying, and Cheri finally getting out of the water. Next to the pool is a spa and sauna. We walked over to the spa. Cheri was inspecting the water and I was near the power switch. I turned the thing on for the least amount of time possible and just as Cheri stuck her piggies into the water, it started to bubble. So of course, Cheri thought it was activated by her foot in the water. She exclaimed, “It starts when you step in!” and I lovingly laughed until I was bent over. I pointed out the switch right on the wall. Pam put her sore ankle in the whirlpool and said it felt better after doing that, not cured – but better. We all walked back to the house and got rinsed off. We ate anything not nailed down. Cheri and I had both coffee and watermelon – a daring adventure for old women at night. We played some Scattegories, read, did crossword puzzles and drifted off to bed. It was a quiet day. Pam went out to find a newspaper and buy some sweet rolls for breakfast. Cheri didn’t feel so good, but managed to find a place for a cherry Danish. That didn’t make her feel all that much better. We lounged around, reading. Cheri and I were reading books while Pam read the newspaper ads looking for a sale on phones. Instead, she found sales on televisions. Every store had them on sale since the high definition thing is going to make all older sets not so good. They were so busy with the vision portion of the tele- that they completely ignored the phone portion. Bummer. Pam also noted the obituaries. There was one in there that took perhaps six inches of two columns and was about some woman who dearly loved – essentially worshiped – Arizona. She died in California. She was pre-deceased by two husbands, each of whom were recognized in her full name. She was survived by her third husband whose name had no discernible relationship to her own. She had been active in her church – the Methodist of some standing, right here in Arizona. Donations could be made to her California Presbyterian church. It was all very confusing. But the woman may have been popular in her own small circle. The winner of the space race for the obituary page was some dude how got a full quarter of a page to tell about his illustrious achievements. These people are serious about death out here. There were the normal few column inches and a few poor souls who were given two or three lines. I guess they didn’t do much. We eventually got Cheri feeling well enough so we could mosey on over to Jen’s house. Cheri stayed and finished sewing the purse she started a couple days ago. Pam and I took Ryan shopping – first to Michaels (yet again) and then to Target. He was doing pretty good. We found him swimming goggles but had a little problem finding swim fins that were priced within the hoped for range. He did get several other items of interest, most of which didn’t go into his own house. Instead they are hidden at Nana’s. We also found several really cute things for Hannah to wear. The tops were $1-2 and the shorts were all $2. She should have enough outfits mixing and matching the various tops and bottoms. We stayed at Jen’s house while a storm was brewing. We had internet there and so we got our mail and did some searching for information and then decided that even though Sprouts was open, with the storm coming in, we would wait until we knew we wouldn’t get blown off the super highways. Instead we came home and made dinner. It did try to rain but ended up only sprinkling and just a little bit. So after dinner we decided to walk a little bit around Monte Vista. We met a couple adult quail and their ten or so chicks. Those little buggers really move quickly running hither and yon. They don’t do so much with straight lines, but they sure move quickly. We were way towards the back of Monte Vista when the rain began to be more than just a here and there droplet. It didn’t pour, but it was more than sprinkling. There was nothing else to do but continue to walk home. We met a few people in cars who must have thought we were complete idiots. We waved politely and let them wonder what in the hell was the matter with us – without enough sense to come in out of the rain. We got home and Pam was determined to color her hair. Except that it was wet. It is not advisable to color wet hair. So she put a couple pillows on the floor and laid down under the living room ceiling fan and read a book while her hair dried. She has a hair drying and we even know where it is. The above behavior is simply inexplicable. Her hair dried, she got it colored. Beautiful. We were all busy reading our books and went to bed as the mood struck us. Jen brought the kids over and we went to the pool. It was later than one would normally begin swimming in Arizona – or far earlier. We went swimming at about 10:30 when it was already getting hot. The sun was shining. We were coated in sunscreen. Grade 30 or higher. While we were waiting for Jen, we dressed in appropriate costumes for the event. Nothing like three grandmothers donning swimsuits to encourage feelings of rampant self-confidence and healthy body concept. Cheri bought a special suit to come out here since she had no suit already in her closet. She selected a black and white patterned one piece suit with a skirt attached. She also needed a beach cover-up for the walk back and forth to the pool. She selected a vibrant magenta patterned with purples and greens muumuu. It’s eye catching, to say the least. Jen was on the way over and as we waited Cheri said that she was worried about the skirt thing because of all the pictures of the dancing hippopotamuses wearing tutus were reminiscent of her outfit. To demonstrate, she did a perfect rendition of the hippo-in-tutu dance. It got us so silly. Jen came and we got to the pool and we got covered in sunscreen and we got into the water. I thought the water was very warm since the last not bathtub water I had been in was the Atlantic Ocean this past spring. THAT was cold. This seemed warm to me, but Jen said their pool was almost bath water temperature. We all got in with the kids being wary of having any of these old people actually in charge of their not drowning. They preferred their own mother to be in charge of that. Cheri found a new problem with her swimsuit. The skirt was only attached at the top of the suit so that the overflowing skirt was floating up around her armpits. A lovely picture there. She then declared the black and white pattern was less hippopotamus and more whale. Slowly and surely, the kids got more used to the grandmother trio being trustworthy and thinking we may have had enough sense to not them fall to the bottom of the pool like a ton of bricks. No, the Nana Patrol could actually be fun. Who knew? Ryan was coming down the steps and hanging on my back and then I walked out into the water and turned us around and went back to the steps. On a subsequent trip I mentioned I had a Ryan on my back or maybe even a monkey on my back. Now wasn’t that creative? So on the next trip out, Jen asked the animal expert what the animal was that attached itself to the back of a whale and lived in a symbiotic dyad. I assumed I was the whale. I turned with an incredulous look – or possible some other look. MY suit is white with red flowers patterned across it. Harrumph. Cheri thought it was the funniest thing she heard all day. Hannah started getting tired of the whole pool thing. She and Nana went to get the mail and then Pam, Hannah, and I headed back to the house. We had a roast to get into the crockpot and we all needed to get out of the sun. The rest of the crew returned shortly and we all had lunch. Jen and Cheri took the kids back to Jen’s house. The two adults were going to make Cheri a purse while the kids rested and/or napped. They did get most of the way finished with one before they came back to Pam’s. Pam went to church and the Methuselah priest had the Mass. He spoke for 20 minutes speeding through 35 (yes, she really counted them) different discrete topics. Apparently he is not an in-depth sort of guy. Dinner was delicious, Jen and the kids went back home, and the adults were plain tired and went off to bed quite early. Too much fun does that to an old person. Although we aren’t as young as we look.